You have made the decision to add a deck, but realize that the only potential location is in direct sunlight for the majority of the day. Will it be worth making the investment to add an outdoor living space? Or will it only need to be replaced in a couple years due to the harsh effects of UV rays? Working with reputable deck installers, such as Quaker State Construction in Pittsburgh, will provide you with the confidence needed in making tough decisions on the best materials for your home’s new addition. The sun in western Pennsylvania may not be as strong as in the South, but the damage caused by direct sunlight in either location can be equal. It is no surprise that UV radiation from the sun will age anything that is exposed to it—look at what it does to our skin when we are outside too long without the proper protection. A deck is no different when it comes to its damaging effects. Prolonged exposure to harsh UV rays can fade or discolor your outdoor investment in a short period of time, causing it to have a drab, grayish hue. Choosing the right material for your new deck will allow you to enjoy many years of outdoor living and entertaining. Wood is a common choice for homeowners when it comes to building a deck. Unfortunately, not all wood is the same. Making the wrong choice of wood could lead to costly repairs due to warping, cracking and splitting from unwanted moisture and other weather-related elements. Additionally, it must be regularly maintained to extend the life of your deck. 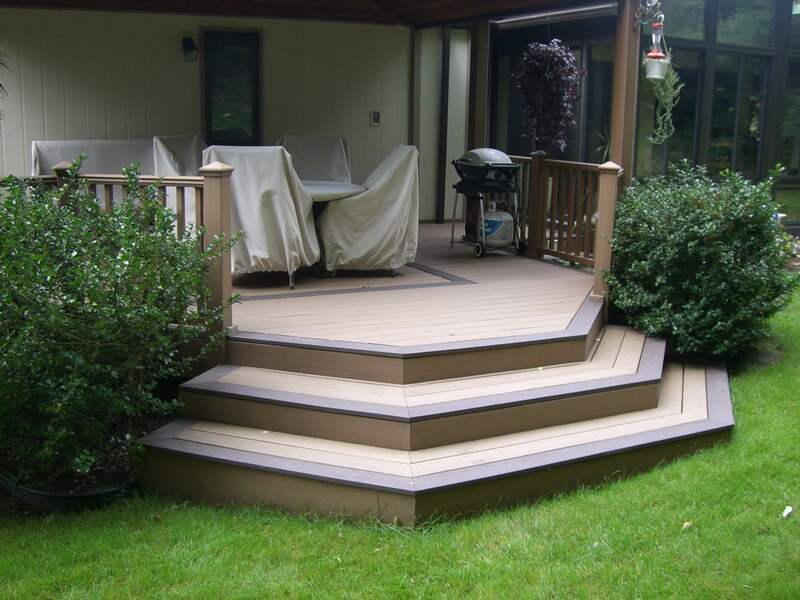 Deck staining not only enhances the natural beauty of the wood, but it reflects UV rays, prevents water infiltration and minimizes fungal growth. Stain with heavy tint works best to protect the wood from UV radiation. RainWood® brand products are treated with the same micronized copper preservative used in YellaWood® brand products. But we take it a step further and apply a water repellent during the process. This assures water resistance on all four sides of the board, providing protection to the sides typically missed by a brush or spray-on repellents applied after installation. It also means you don’t have to worry about applying a water repellent to your project after it’s been installed. You’re free to enjoy it from day one and don’t need to worry about applying a water repellent until next year. Adding accessories, such as sunshades and awnings, available at Quaker State Construction, can extend the life of your wooden deck for a few more years. Composite, more expensive than most woods, requires little maintenance. This decking material, made from a blend of plastic and wood fibers, has become a popular choice for many homes in sunny climates. The material is not as stiff as wood—allowing it flexibility in varying temperatures. When choosing composite decking, be sure to look for full capping. With full capping, there is a protective substance containing UV-resistant compounds that seals the boards. Therefore, there is no maintenance required to keep the boards structurally and aesthetically sound. Other than scrubbing regularly to prevent mildew, this type of decking is a breeze to maintain. At Quaker State Construction, we have a variety of quality composites from which to choose. Most of today’s composites look just like real wood and some of the newer versions are even mildew-resistant, requiring no maintenance. Quaker State Construction, located in Carnegie, PA, has been offering quality expertise in deck construction in Pittsburgh and the surrounding area for more than 58 years. We pride ourselves on using quality materials from the industry leaders in home improvement and construction materials. For more information on deck installations, please call 800-262-DECK. Our success depends on your satisfaction. We will work with you every step of the way.